I’ve always been enchanted by sunrises and sunsets, and I’m forever trying to capture the ultimate dramatic empyrean photo. In times gone by, this involved checking the almanac to find the appropriate schedule to catch the morning or evening showing of the sun or moon. However, knowing the right time didn’t always entail being at the right place. These days, thanks to some great software (as well as the ready availability of GPS) I can be in both the right PLACE and the right time. 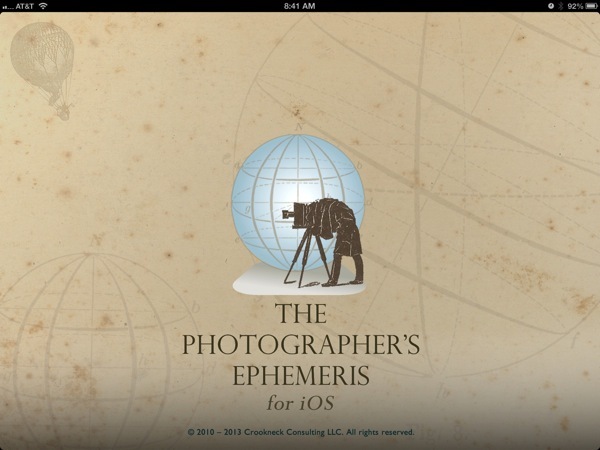 I’m speaking of The Photographer’s Ephemeris, a wonderful application that runs on the desktop, on my iPad, and on my iPhone, as well as Android devices (for the benefit of my friends who aren’t iOS users). The Photographer’s Ephemeris, which I’ll call TPE from here on out, is quite simply a combination of maps and sun/moon almanac. 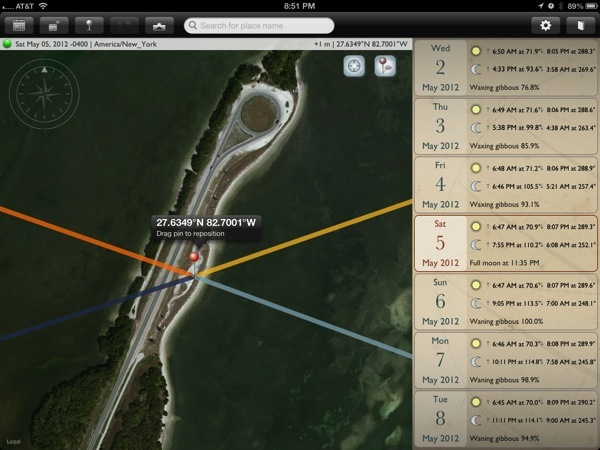 With it, you can determine the angle and direction of the sun or moon at any time during the day, on any given day. It’s really quite marvelous. You launch the software, and you see a map. On the map, centered at the current location, are four lines emanating from the center point. Two orange lines represent the sunrise and sunset, and two blue lines represent the moonrise and moonset. Next to the map is a calendar – your almanac, giving the times of sun and moon rises and setting for each day, based on the current location. Now, here’s where it gets interesting. 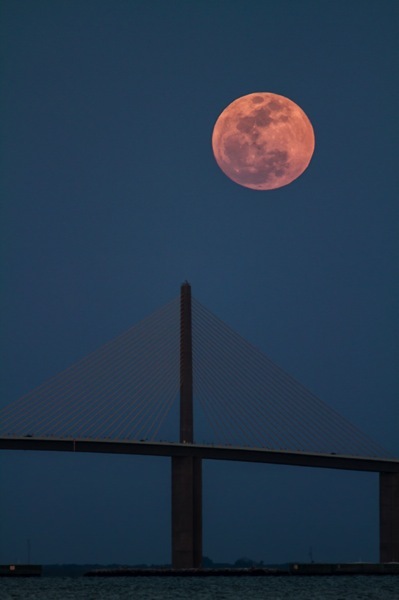 Let’s say there’s a local landmark, and you want to align the moonrise with that landmark. Simply drag the map around so that the lines pass over the point of interest. Now, keeping it lined up, move the center point to somewhere you can take up station for your photography. 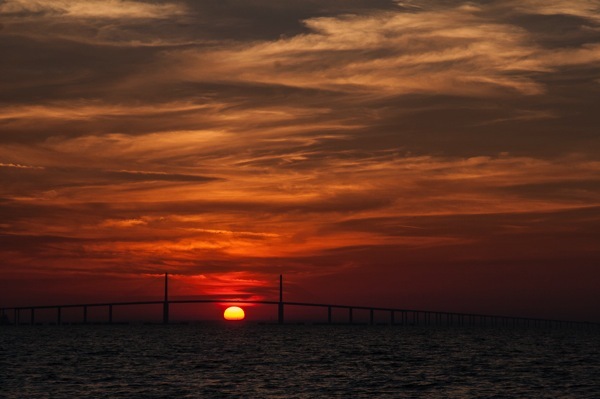 For example, I wanted to capture the full moon rising behind the Sunshine Skyway Bridge that spans the mouth of Tampa Bay. It’s a tall, scenic suspension bridge, and – fortunately for my photography – there is a park just to the west of the bridge, across the water. The trick was to find the location along several miles of park beach, where I would witness the moon rising between the spans of the suspension bridge. Using TPE, I was able to pinpoint the correct location. That gave me a good idea of where to park my car. 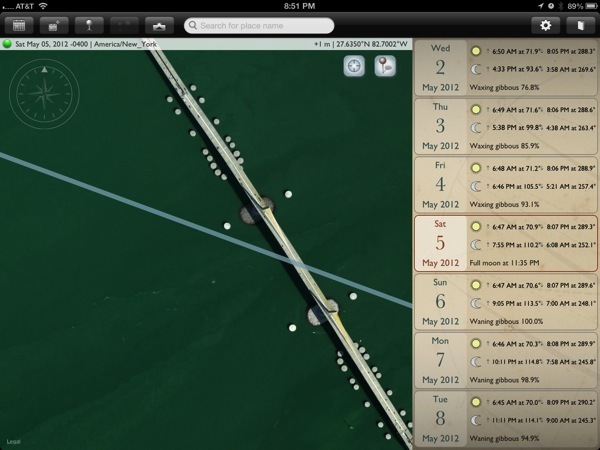 Arriving on the scene, I was able to use my iPhone, with built in GPS, to position myself exactly along the beach, where the moon would be in the correct alignment. I can tell you, it worked with stunning accuracy! I was able to repeat the process a few months later for a sunrise. Checking TPE, I saw that I would have good access to a spot to witness the sunrise between the spans. Once again, TPE on the desktop gave me the approximate location and guided my parking, while TPE on my iOS device allowed me to pinpoint my location on the beach. The results speak for themselves. I was able to capture an amazing sunrise, dead center between the spans. Perhaps not surprisingly, I found the more interesting images to be with the sun closer to one span or the other, although the crescent peeping above the horizon line is quite gorgeous. Created for photographers by a photographer in 2009, TPE is a software tool available for desktop and mobile devices to help you plan outdoor photography shoots to ensure the best possible natural light. TPE for Desktop is a free download and runs on Windows and Mac courtesy of Adobe AIR. 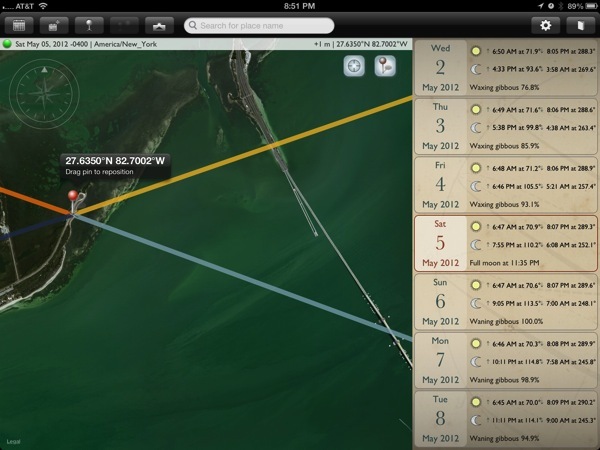 TPE for iOS is available for purchase on the App Store. TPE for Android is available via Google Play. If you’re interested in sun and moon shots, I’d encourage you to check into TPE. Since the desktop app is free, it’s easy to get started. But, for me, once I used the iOS app on my mobile device, I was hooked. This is a great piece of work, and an important part of my photography arsenal. 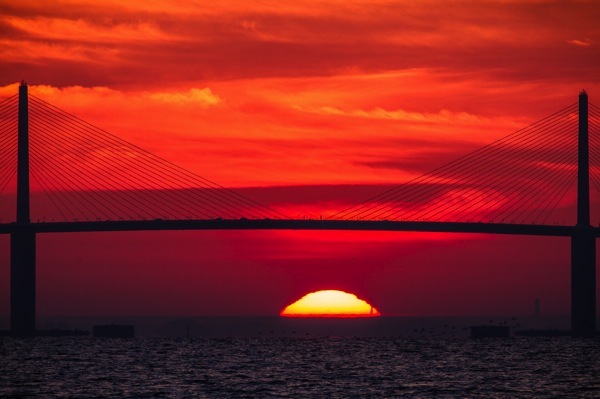 This entry was posted in Photography and tagged Ephemeris, Photography, Softtware, Sunrise, Sunset, TPE.